More people are becoming aware of the health benefits of ancient grains and seeds, such as amaranth and chia seeds, but incorporating them into one’s diet is not always easy. 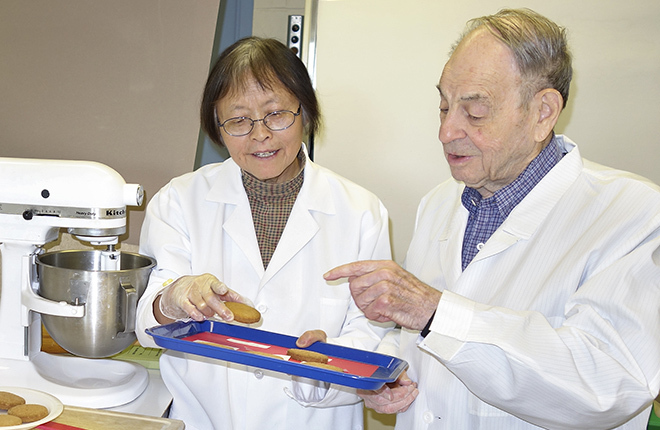 That could change in the near future as Agricultural Research Service (ARS) scientists explore the physical properties of these foods, blending mixtures to make treats like sugar cookies that are tasty and good for your health. At the ARS National Center for Agricultural Utilization Research (NCAUR) in Peoria, Illinois, scientist George E. Inglett and his assistant Diejun Chen have developed amaranth-oat and chia-oat composites that may be used to create foods with health benefits that include lowering the occurrence of heart problems, diabetes, and obesity. Amaranth flour contains lysine, an essential amino acid, and oats contain beta-glucan, known for lowering blood cholesterol. The researchers blended the two ingredients to make nutritious, gluten-free sugar cookies. 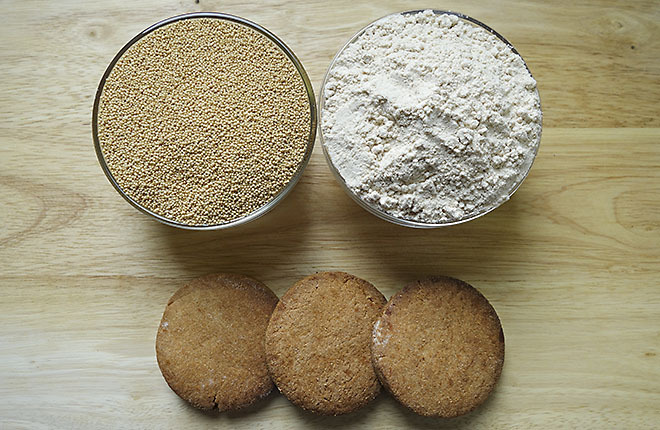 The team compared the amaranth-oat composite cookies and doughs with those made with amaranth or wheat flour alone. 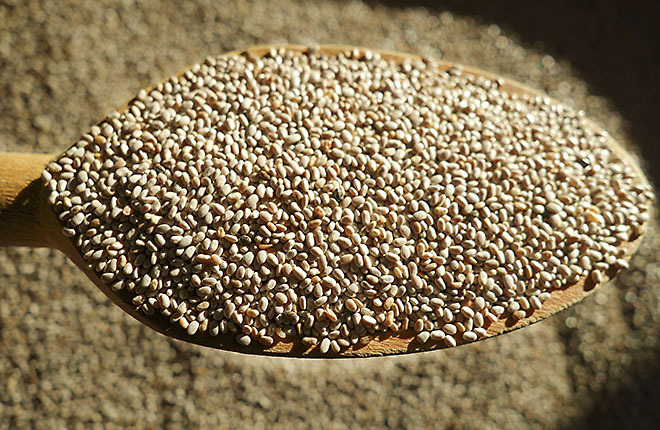 Amaranth and its composites had improved water-holding capacities compared to wheat flour. Differences were found in the hardness and shape of doughs and cookies. There were no significant differences in color and flavor among all cookies. “Our amaranth-oat cookies were acceptable in all aspects. They had improved nutritional value and physical properties along with gluten-free uniqueness,” says Inglett, who works in NCAUR’s Functional Foods Research Unit. The same can be said for cookies made from the chia-oat composites. Scientists dry-blended Nutrim (a commercial product developed by Inglett that is made from barley or oats), oat bran concentrate, and whole wheat flour with finely ground chia to come up with the powdery mixture. In addition to Nutrim, Inglett also developed Oatrim, used as a fat replacement in baked foods; Z-Trim, a zero-calorie insoluble fiber gel that is prepared from high-fiber agricultural products like corn and oat hulls; and Calorie ControlTrim, which contains 20 to 50 percent beta-glucan. In recent studies, Inglett found that the amaranth-oat and chia-oat composites have excellent physical properties, which contribute to improved cookie texture, and their nutritional qualities may be valuable in healthful foods. “Oats are good for you, but we don’t get enough. I try to make oats more palatable and available not only for breakfast, but also for lunch and dinner,” Inglett says. “That’s what my research has been all about over the years—making nutritious food to promote better health.”—By Sandra Avant, Agricultural Research Service Information Staff. “Making Cookies With Ancient Grains and Seeds” was published in the March 2016 issue of AgResearch Magazine. ARS scientists blended oats with chia seeds and amaranth. The oat blends may have benefits to health. The scientists used the oat blends to make cookies. The cookies were acceptable in all aspects.